If ever you fancy a trip back in time, by say, about 10 years, just install Solaris. The moment that installer starts, assuming you can get the graphical installer to start, you'll be thrown back in time by about 10 years. Not for long though. The new installer is working and on it's way, soon. Unfortunately, development on the Solaris installer has been neglected for well over 10 years. Other than the odd bug fix here and there and a set of new graphics, nothing much has changed in the installer. Over the last year or so, there has been a lot of work put into the new Solaris installer under the Caiman project on opensolaris.org. Finally Solaris is looking like the powerhouse OS that it is. Not only will the installer sport a modern new look, it'll be a lot better at identifying graphics devices (most of this is already in place thanks to the work on Xorg) and other installed operating systems and it'll provide a much more comprehensive installation experience, much like you'd expect from a modern OS. You can find out more details of what can be expected by checking out the Dwarf sub-project. Things won't just stop there either. There is a substantial roadmap for future developments including a Live CD/DVD installer, a new packaging approach, ZFS-based upgrade (live upgrade like) functionality, and a tool set to help individuals readily roll their own binary distro. ie a custom version of Indiana. The new installer code is targeted to be included in Nevada b70 and is due to make it into Solaris Developer Express 09/07, if you're using the SXDE path to evaluate the upcoming features. You can find a series of full size pics at http://www.gnome.org/~gman/gui-install/. 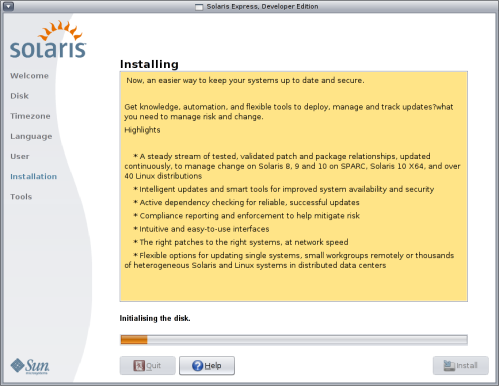 For those lucky enough to never have performed or seen a Solaris GUI installation, check out the installation procedure detailed in the Basic Installation guide on docs.sun.com.